Aaron grew up in a family of criminal defense attorneys. Criminal defense is all he has had ever known. So, when it came time to choose a career he did not have to think twice. Aaron realized early on that being a criminal defense attorney was more than following in his family's footsteps. For Aaron, defending those who have been charged with a crime is an opportunity to defend their constitutional rights afforded by the United States Constitution. Before his career as a defense attorney, Aaron was raised in Phoenix, Arizona and attended Brophy College Preparatory. After graduating from Brophy, he attended The University of Arizona where he majored in Political Science. While in college, Aaron was a player and the president of Arizona Rugby Football Club. Upon graduating from college, Aaron decided to pursue a Law Degree. He followed a long family tradition and attended the University of South Dakota where he focused his studies on becoming a criminal defense attorney. While obtaining an excellent education, he spent time on the South Dakota family farm hunting and fishing. Aaron was quickly employed by the Office of the Maricopa County Public Defender after passing both the Arizona and South Dakota Bar Exams. During this time he became more confident that being a prosecutor was not something that he wanted to pursue. Aaron has never had a desire to ruin anyone’s life by putting them in jail because they made a mistake. During his time as a public defender, Aaron became more interested in focusing on DUI defense in Arizona. As a Deputy Public Defender, Aaron defended hundreds of individuals charged with serious felony offenses including Drug, Conspiracy, Aggravated Assault, Aggravated DUI, Manslaughter, Murder, Money Laundering and almost every other crime in Arizona. During this time Aaron honed his skills as a defense lawyer. Aaron looks at his job as a check and balance on the Police, Prosecution and the Courts. He truly enjoys protecting his clients so that they do not get convicted of a crime by the government with undue haste. He focuses on the fact that we all have Constitutional Rights and he is proud that he can guarantee his clients’ Rights are protected while in the court system. Aaron does not care if his client committed a crime. In fact, it’s not even a question he asks. What he truly focuses on is if the Government can prove their case beyond a reasonable doubt. Good people sometimes find themselves in bad situations. To Aaron that does not mean that those caught in a bad situation are criminals or even guilty of a crime. Aaron spent countless hours in the courtroom, argued over 50 jury trials, tried over 100 bench trial, and became a highly experienced litigator. Aaron’s trial experience sharpened his litigation skills, giving him invaluable insight into the legal system and making him one of the premier defense attorneys in Phoenix, Arizona. Currently, Aaron is in private practice as a criminal and DUI defense lawyer. His focus on Criminal Defense and DUI Defense in all Arizona justice, municipal, state and federal courts has resulted in widespread recognition and numerous awards. Aaron is licensed to practice law in the states of Arizona and South Dakota. The National Advocacy for DUI Defense recognized Aaron Black as one of the Top DUI Defense Lawyers in Arizona for 2014, 2015, 2016 and 2017! 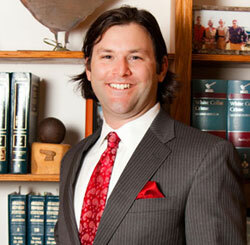 The 2012 and 2013 Southwest Super Lawyer Magazine named Aaron a Rising Star in Criminal: DUI Defense. Super Lawyer Rising Stars are nominated by their peers, and consist of no more than the top 2.5% of lawyers in their field of law under the age of 40 in Arizona and New Mexico. In 2014, 2015, 2016, 2017, and 2018 Southwest Super Lawyer Magazine named Aaron a Super Lawyer in Criminal: DUI Defense. Super Lawyers. Very few lawyers in the Phoenix area achieve such status during their career. Many never jump from the Rising Star list to the Super Lawyer list. 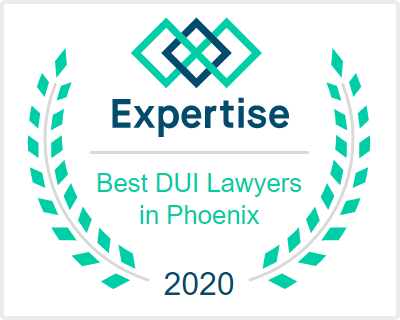 In 2016 Aaron was the ONLY lawyer to be recognized as a DUI Super Lawyer in the Greater Phoenix Area. Only three DUI lawyers total were selected in Arizona and New Mexico. 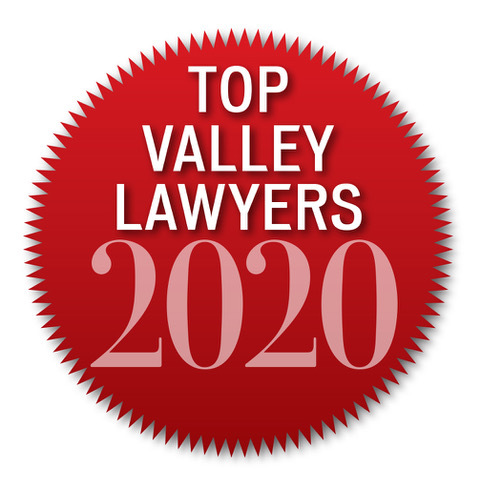 North Valley Magazine rated Aaron as one of the Top Valley DUI Lawyers in 2012, 2013, 2014, 2018. 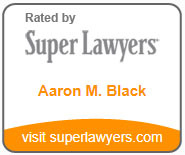 AVVO.com rates Aaron as a Superb 10.0 Lawyer. Read his Clients' Raving Reviews! Aaron is rated by Martindale-Hubbel as an AV - Preeminent Lawyer; the highest level of professional excellence. In 2013, 2014, 2015, 2016, 2017, 2018 Aaron was recognized by The National Trial Lawyers and awarded the "Top 100 Trial Lawyers" due to his litigation skills. "Top 100 Trial Lawyers" is an invite only Membership offered to the most qualified attorneys in each state who demonstrate superior qualifications of reputation, influence, stature and public profile. 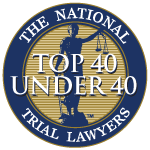 The National Trial Lawyers also distinguished Aaron as a "Top 40 under 40" criminal defense lawyer due to his superior qualifications, trial results, and leadership as a young lawyer under 40 in 2013, 2014, 2015, 2016, 2017, and 2018. In 2015 Aaron was inducted into the National Association of Distinguished Counsel. He is now in the company of the Top 1% of the finest lawyers in the country. This is a four level selection process that includes consideration by a blue-ribbon panel of attorneys and a judicial review board led by a group of former judges. Aaron possesses the court and trial experience necessary to defend you when your freedom is at risk and he is dedicated to putting his skills and experience to work for individuals charged with serious offenses and DUI in Arizona. 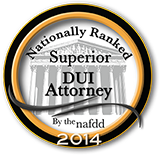 Please contact DUI Defense Attorney Aaron Black or call to set up a free telephonic consultation today 480-729-1683.